News reports indicate being unemployed is a financial challenge. That’s true even when you know you won’t lose any salary in the long run. An estimated 800,000 federal workers have missed at least one paycheck due to the partial government shutdown. Another estimated 1.2 million federal contractors have also missed paychecks. Now, some federal workers are Uber drivers. Some are substitute teachers. Thousands are turning to food banks. Some face medical crises. Others are delaying medical care. The news is depressing. But it’s small compared to what lies ahead. I’m not minimizing that. I’m not taking a position on the shutdown. I’m noting this news offers important insights. It tells us the next recession will be devastating. The government shutdown highlights many people live paycheck to paycheck. This includes both government workers and private-sector workers. Yet, government workers make more money than average families. The average government worker earns over $84,000 a year. That’s almost 37% more than the median family. Census Bureau data places median income at $61,372. Even with higher-than-average income, government workers are suffering. They need a safety net to cover food, gas and mortgage or rent payments. This story dominates the news. The stories cover problems of 2 million workers. In the next recession, we’re likely to have much more than 2 million unemployed. 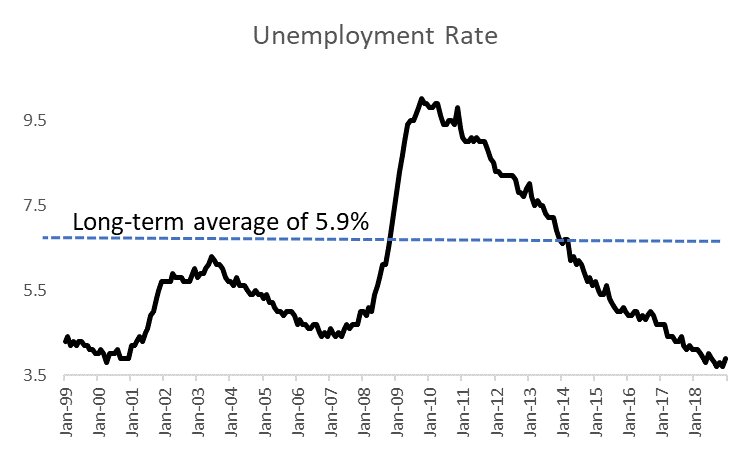 In the past 20 years, unemployment averaged 5.9%. That was the peak in the 2001 recession. It was a relatively mild, eight-month recession. Unemployment reached 10% in the last recession. To reach 5.9%, at least 6.1 million Americans will lose jobs. That’s three times more losses than the shutdown caused. In past recessions, the government stepped in with benefits to ease financial pain. The safety net includes unemployment benefits. Other programs also provide short-term aid. Those programs will help in the next recession. But they can’t be enough. The problem: the budget deficit. We never had $1 trillion budget deficits when the economy was growing. In the next recession, the deficit will grow even more. To find buyers for the flood of Treasurys, interest rates will go up. Higher interest rates reduce the amount of money businesses can borrow. That’s why the Federal Reserve usually cuts interest rates in recessions. If the market demands higher rates, the Fed will be powerless. Government spending won’t be enough to restart growth either. Increased spending will help families cope with job losses. But consumers will still cut their spending. That will send the economy into a downward spiral. History tells us what to expect in the recession. Interest rates rose in the 1970s, creating stagflation. That ended when short-term interest rates topped 15%. Unemployment hit 10.8%. Real interest rates rose in the 1930s. They peaked in 1932. That was when the stock market bottomed. By then, the Dow Jones Industrial Average was 89% below its 1929 high. Government safety nets won’t prevent widespread hardship. Safety net spending will scare bond market investors. Economic problems will get worse. The Fed and the federal government will quickly run out of policy tools. There is good news. Eventually, growth will return. It might be slow and uncertain growth like we saw in the late 1930s. It might be the inflationary growth of countries like Venezuela right now. But it can’t be the steady and beneficial growth America has known since the 1950s. The policies that created that growth are now useless. The next recession will destroy many dreams. And it’s time to invest defensively. Next »The January Barometer — A Broken Instrument or Valuable Tool?